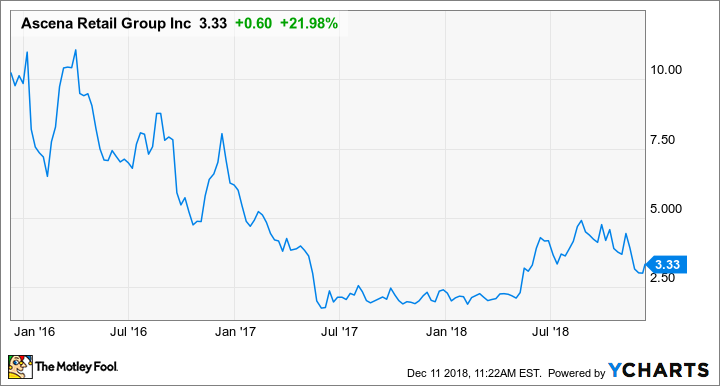 What's Driving Ascena Retail Group 25% Higher Today? Here's what investors need to know about the apparel retailer's first-quarter results and its outlook. Shares of Ascena Retail Group (NASDAQ:ASNA), a leading retailer of women's apparel, shoes, and accessories in the premium fashion segment, had soaring 25% as of 11:05 a.m. EST on Tuesday, after the company released results for the first quarter of fiscal 2019 that were better than expected. Net sales during the first quarter checked in at $1.592 billion, higher than analysts' estimates and better than the prior-year period's $1.590 billion. The better-than-expected top-line growth was driven by a 3% increase in comparable-store sales. Adjusted earnings per share checked in at $0.06, better than analysts' estimates calling for $0.03, and at the high end of management's guidance. We have built a solid foundation over the course of our transformation, consisting of new brand leadership and significantly enhanced enterprise capabilities. We've strengthened this foundation through an enhanced understanding of our customer that we have developed from our recently launched customer insights initiative. We believe our efforts are beginning to produce positive results, and are focused on building upon our momentum. The good news for investors is that management believes this momentum is sustainable throughout the year, forecasting 2% to 4% gains in second-quarter comps and low-single-digit comps growth for the full year. While that might seem modest, it sure beats Wall Street's forecast for a 1.6% sales decline for the full year. If management can deliver on its comps growth targets as well as improving gross margins, which were hit by higher shipping costs and product markdowns, it could be a much stronger year than the company has delivered recently.